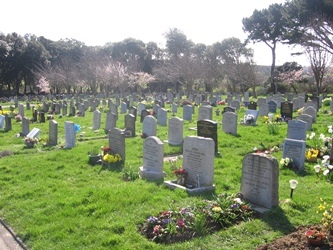 The principal cemetery in Swanage is at Godlingston, to the north of the town itself. It was opened in 1932 and extended in 1966. It lies in a beautifully peaceful setting close to Nine Barrow Down Hill and is a haven for wildlife, with deer and green woodpeckers being regular visitors. At present both grave spaces and plots for the interment of ashes are available. Memorial plaques at the base of the trees that line the cemetery roads and paths are also permitted. 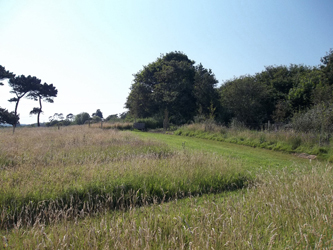 An area next to the formal cemetery at Godlingston has been set aside for a meadowland burial ground as a 'green' alternative to traditional interment and will see the development of an area rich in native meadow plants and wildlife. The meadowland will be maintained in a way that encourages and protects the trees, wildlife and natural wildflower seeds. The traditional 'neat and tidy' appearance of cemeteries will not apply to this area and the grass will be cut infrequently to encourage wildflowers to flourish. There is a Garden of Remembrance for those that wish to scatter ashes. This will also be managed as a wildflower area. For those that have scattered ashes here, a Book of Remembrance will be kept at the Town Hall and an entry will be made in the book as a permanent record. As the meadowland will be kept completely natural, no memorials will be permitted, but each plot will be identified by an electronic marker peg that will record the details of the person interred. The cemetery records for Godlingston Cemeteries are kept at the Town Hall and the staff are happy to undertake a short search to locate a relative’s grave. Due to the high demand for this type of enquiry, and the limited resources at the Town Hall, it is preferable to make an appointment. Please e-mail admin@swanage.gov.uk or call 01929 423636 to arrange a mutually convenient appointment. Thank you. The early records for Northbrook Cemetery are now held at Dorset History Centre telephone number 01305 250550. More extensive research can be organised through Swanage Museum and Heritage Centre. For anyone interested in research please visit this informative website - Dorset Online Parish Clerks. The Town Council also owns the former Congregational Burial Ground off Queens Road and is responsible for the maintenance of the Church of England burial ground on Church Hill. The Town Council is a member of the Institute of Cemetery and Crematorium Management, which provides advice and training to cemetery operators nationally. Further information can be found on their website www.iccm-uk.com.